2016 is an election year in the US, a time when Americans of all political persuasions come together to partake in a rational discourse, exchanging ideas as they work to decide who among them is most qualified to lead their great nation into the future. Just kidding! Not about it being an election year—it is—but about all the other stuff. 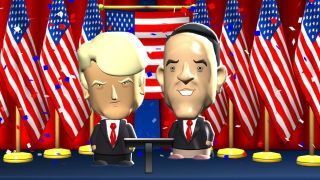 In reality, it's a time of super-heated rhetoric, unrestrained nastiness, and grotesque behavior—and also time for a new version of Stardock's election simulator The Political Machine. The Political Machine 2016 is all about getting elected by any means necessary. Sling some mud, take advantage of circumstance, say stupid, obscene things on national radio, and spend, spend, spend. It includes more than a dozen pre-made, real-life candidates, like Hillary, Bern, and The Donald, and if you don't care for any of them (and who could blame you?) you can create your own instead. National hot-buttons are a priority, but regional issues will have to dealt with as well: Embrace some, bury others, and try not to alienate too many people on your quest to mainstream acceptability (and ownership of the nuclear football). The Political Machine 2016 is available now on Steam for 25 percent off until February 12, which is also when the Steam Lunar New Year Sale ends. (Coincidence or conspiracy? You decide!) Owners of The Political Machine 2012 may opt to upgrade to the new edition directly from Stardock for $5.